Trigger Tome® is a single-use, precision surgical instrument that provides the surgeon unparalleled accuracy when performing a trigger finger release. 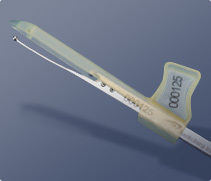 With its narrow leading tip, a smaller incision is required to access the A1 pulley. Trigger Tome® has been designed to provide the hand surgeon with a precise, less invasive alternative for performing a trigger finger release.